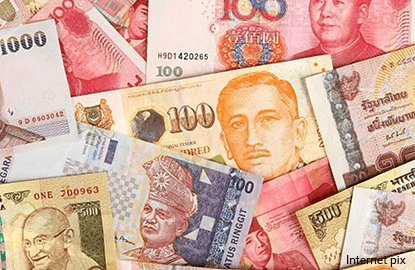 SINGAPORE (Feb 16): The Taiwan dollar climbed to a 20-month high on Thursday, and the South Korean won hit a three-month peak, after data showed the US economy was on a solid footing, boding well for Asian economies. A pullback in the US dollar, after it set a one-month high against a basket of six major currencies on Wednesday, also lent support to emerging Asian currencies. The Taiwan dollar rose to 30.66 per US dollar at one point, its strongest level since late May 2015. It later turned lower and was last down 0.2% on the day. The South Korean won climbed as high as 1,133, its highest since Nov 9. The won later pared its gains and was last up 0.1% at 1,140.70. The won pared gains after South Korea's finance minister said there was some severe volatility in the currency market. The comments heightened jitters about the possibility of central bank intervention to curb the won's appreciation, and triggered a pullback in the won. Elsewhere, the Chinese yuan and Thai baht edged higher against the US dollar. Asian currencies showed resilience even after US Federal Reserve Chair Janet Yellen's testimony to Congress this week and upbeat US economic data were seen raising the chances the Fed would raise interest rates in March. Signs of solid US economic growth, however, are positive for Asian economies, who will benefit from exports, and a supportive factor for regional currencies, analysts said. "I think the main driver here is still the global reflation theme. Recent data shows that reflation is intact and broadening out globally and we're seeing the pick-up in the trade data across Asia," said Sim Moh Siong, FX strategist for Bank of Singapore. Data on Wednesday showed that US retail sales rose more than expected in January and consumer prices recorded their biggest gain in nearly four years, while manufacturing output rose. But Asian currencies could face headwinds if Fed officials continue to deliver hawkish comments on the monetary policy outlook, said Gao Qi, FX strategist for Scotiabank in Singapore. Under that scenario, the US dollar is likely to rise across the board, although the gains will probably be modest, he said. "We don't expect a big gain in the dollar index as an excessively strong dollar is not in Trump team's interest," Gao said, referring to US President Donald Trump's administration. Malaysia's economy grew 4.5% in the fourth quarter from a year earlier, ending a year of tepid growth on a stronger note helped by solid exports and resilient domestic demand, data showed on Thursday. There was little reaction in the Malaysian ringgit, which was down 0.2% on the day. The rupiah held steady ahead of an interest rate decision by Indonesia's central bank, which is expected to keep its benchmark interest rate steady at 4.75% on Thursday. There was little reaction in the rupiah to the news that the race to become governor of Indonesia's capital was heading for a second round between the incumbent Christian and a Muslim former education minister, after neither appeared to win a majority in Wednesday's election.